Piano Accompaniment. Edited by H. Voxman. Concert Band Method. Rubank Solo Collection. Solos, Classical, Contest. Softcover. 72 pages. Rubank Publications #RUBL2938. Published by Rubank Publications (HL.4471700). A top-rated collection of solo literature offering each instrument a variety that is simply superb. A very high percentage of the solos in these books are included on various state contest lists. Piano accompaniments published separately. 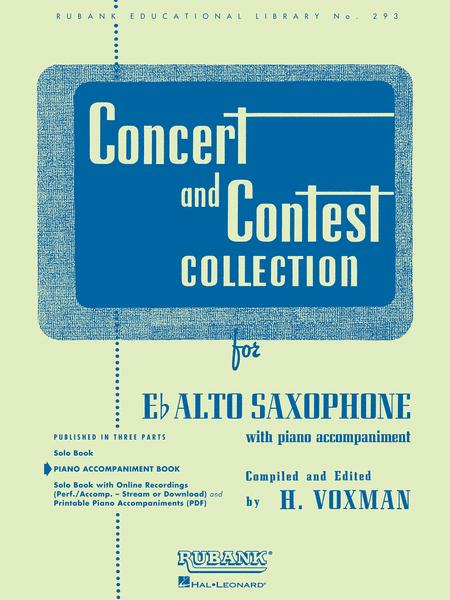 I have bought many books for my alto sax before, but few if any can compare to this. It gives many different styles of playing and is just fun altogether. 23 of 54 people found this review helpful. I am a woodwind student and have only been learning a few years, but this book has provided me with very many and wonderful different styles and pieces of music. I love it, it hasn't left me once! 22 of 51 people found this review helpful. 26 of 53 people found this review helpful. I played this song this year for solo at regionals and boy I will never play this song again, not only does it not have any melody its just a bunch of difficult rythems that I just can't see why they're there. 25 of 58 people found this review helpful.